plus a full archive of those recordings! To participate with these TeleTalks on the phone in the USA every Wednesday morning at 10 AM Mountain Time, USA, dial 712-770-5572, then enter the regular access code 506311#. To find the phone numbers from tons of other countries, please CLICK HERE, then use the same access code 506311#. To translate this 10 AM Mountain Time USA to your time zone, please CLICK HERE. In 2009, Baba Siri Chand, that amazing yogi who historically lived in India in the 1500s first gave Siri-Gian the command to “create free teleclasses on Wednesday mornings at 10 AM Mountain Time, USA and make them available to anyone who wants to join in. Then the instruction was for Siri-Gian to “listen to Baba Siri Chand and repeat what he said to the assembled gathering on the call.” And happily we have been doing that ever since! In these hour-long calls, first each person joins in, and we tune in to that great higher realm. Then Baba Siri Chand gives us incredible explanations of the truly spiritual life, or how Creation actually works, and he leads us through incredibly uplifting and healing guided meditations that take a totally unique perspective each time! Deep happiness and peace are the results. And of course, healing energy reaches every person whether they listen live or from the recordings. Then we hear how the talk impacted each of those on the call, which helps everyone of us expand our realization of what was said. We would love for you to listen to these recordings anytime, or download them for free, or join us live from anywhere in the world. You can see our telephone numbers that are local to many countries across the globe and the access code at Call-in Numbers. However, the correct US number is 701-801-1210. And check the time of the call in your time zone HERE. (Disregard the date given because these calls happen every Wednesday.) Enjoy! I can hardly describe -- though I'm sure Babaji knows if he cares to know -- how many times a day I say "Oh thank you God, thank you." Or how many times a day I feel this uplifting, soaring energy that lifts me. 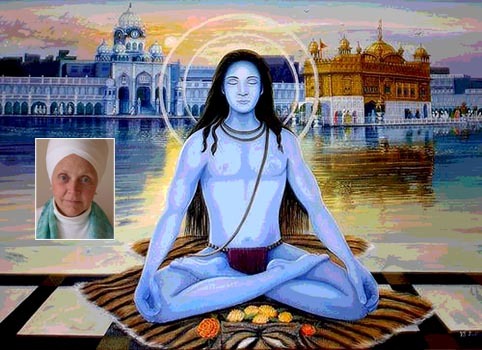 That gives courage, that gives blissful trust in Babaji. That knows one can believe and trust the rest of one's existence. I can merely follow the teachings he gives us each week, but for myself, I can only feel I have been given, been allowed a stronger, wiser existence extending through eternity and I KNOW there is he who will be a friend, a spiritual teacher and guide. Baba Siri Chand apparition and healing from Deslie. Click here! Baba Siri Chand is such an inspiration to all who hear his Talks as given by Siri-Gian Kaur on Wednesday mornings. These recordings are available below. with their kind donations to help us expand this important work for you! Wouldn't you like to help us out? Please donate NOW!!! All calls are copyrighted by Siri-Gian Kaur Khalsa, 2009-2018.